Spring in Los Angeles is well underway, and so is the city’s popular Yamashiro Night Market. The weekly food, arts, and music bazaar takes place every Thursday evening through the end of September at the iconic, Japanese-themed landmark perched high above L.A. in the Hollywood Hills; breathtaking views of the city’s skyline serve as the backdrop. Consider this year’s iteration of the event an official comeback of the original market helmed by City Farm, which ran from 2009 to 2014. 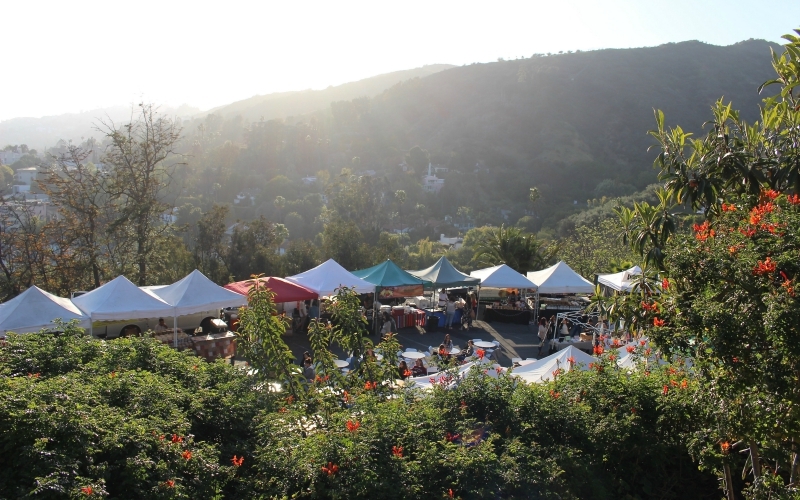 When 2015 rolled around, the Glover family, who owned Yamashiro, were in the midst of selling the property, and that’s when the night market ceased to exist, according to City Farm founder Nick Spano. Last year, the new owners of Yamashiro, JE Group, tried to resurrect the market on their own, but this year they called Spano for help. 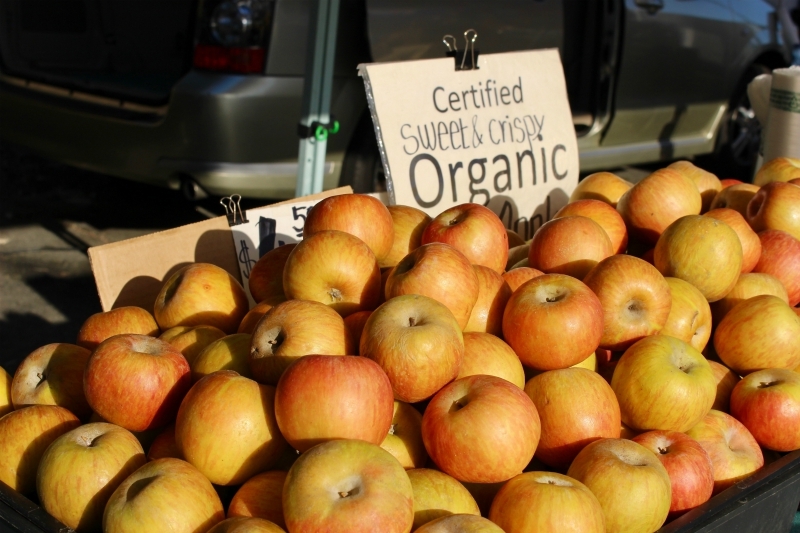 While there are a few farmers on site selling seasonal produce as well as other artisanal food vendors you might find at a farmers market—like Brothers Products hummus or Gourmet Blends olive oil and balsamic vinegar—the market is more like a mini food fair. Food stall options include wood-fired, sourdough-crust pizza from Urban Pie, and Middle-Eastern flavors served in Sonoran wheat tacos from Taim Taco. 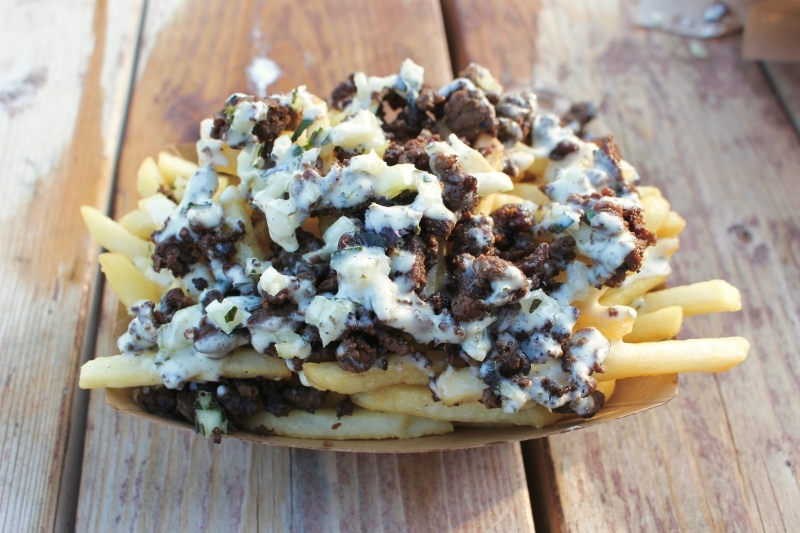 RKKN does its version of Asian-fusion fare, with pho tacos and fries smothered with yuzu steak, and Coolhaus serves up ice cream sandwich goodness. As for the food trucks, the night market will have a couple on site for every event, and they may change as the weeks go on. On a recent Thursday night, Zema Truck was on hand whipping up a serious spread of arepas, and Filipino food truck Spoon & Pork was serving a special lechon kawali, crispy pork belly over rice. While guests can’t bring in outside alcohol, they can purchase wine and Golden Road Brewing beer at a vendor stall and walk around with drinks while shopping. At Yamashiro’s Pagoda Bar, also open on market nights, guests can get cocktails and hang out in the garden while a DJ spins some tunes. Spano’s efforts to bring more arts and music into the fold are making the Yamashiro Night Market a more multifaceted experience. Recently, he arranged to have artist Jim Swill scatter his darkly humorous floral wreaths throughout the property, and he’s lined up bands and musicians that run the gamut from improvisational jazz to acoustic folk-pop to a Spanish guitar player. 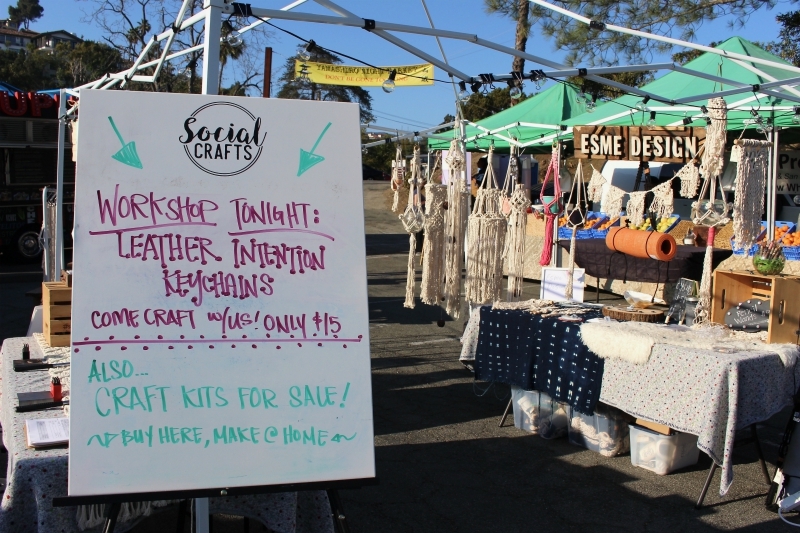 The artists who run Social Crafts and Esmé Design, respectively, operate an area where people can make their own crafts, like macrame plant holders and succulent gardens. In the coming weeks, Spano is planning on making subtle changes to the atmosphere by playing up the setting’s pan-Asian aesthetic. He wants to bring in Chinese lanterns and more vendors with Asian-fusion menus. Recently, the Los Angeles Times published an article that opened up a fascinating debate about whether the century-old landmark is guilty of cultural appropriation. After speaking on the subject with Japanese community leaders, historians, and professors, writer Frank Shyong found that the topic is decidedly complicated. “Arguing about what to be offended over…misses the point. What we’re actually debating is which stories to tell about our cultures, and whose perspectives should be included,” he wrote. Yamashiro Night Market revels in a sort of collision of cultures and communities. “That was part of [the reason behind] starting the [market]: finding these unique spaces in L.A. that would be an attractive destination to bring people together and just have more of that community vibe and experience,” Spano says. As for getting to the market, there are a few options. Currently, guests can park their cars at the Mosaic Church located at 7107 Hollywood Boulevard, and then ride a shuttle—which costs $5 a head and runs every 15 minutes—up to the property. Spano says soon that will all change, and it will be $5 to park a car, with a free shuttle ride. Ride-share services like Uber and Lyft are always encouraged, and if you valet your car at Yamashiro, it costs a steep $25 without validation from the restaurant. Next articleWhat the Hell Goes Into a $100 Margarita?